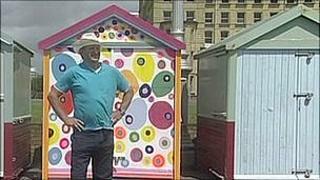 The owner of a beach hut on Hove seafront painted in psychedelic colours has sold it on an online auction site for £24. Jeff Allen had asked a friend to paint the hut, but the transformation proved too colourful for civic officials. Brighton and Hove City Council, whose rules require beach huts to be largely of uniform colour, wanted it repainted. The hut will now be removed from its plot by the winning bidder. Mr Allen plans to buy a new hut for the site.